Get some of that sugar & spice with this Citrus pistachio spice cake! I have been eyeing lebkuchen at the store all November now. I haven’t bought any yet, because it isn’t December just yet, not that it needs to be… but I’m silly and like to get all seasonal with my food sometimes and lebkuchen are such a December thing. Lebkuchen are a German version of gingerbread cookies, that are soft like a cake, and glazed with sugar or chocolate. I really can’t escape these during the holidays, as stores are fully stocked with all possible variations. There are boxes upon boxes stacked in every candy section. Anyway, I am so buying some this weekend but before that comes I wanted to bake something spicy myself. I’m not using ginger just yet, but I made this Citrus pistachio spice cake with an amazing crackly lemon sugar glaze that honestly tastes just like lebkuchen, in cake form. 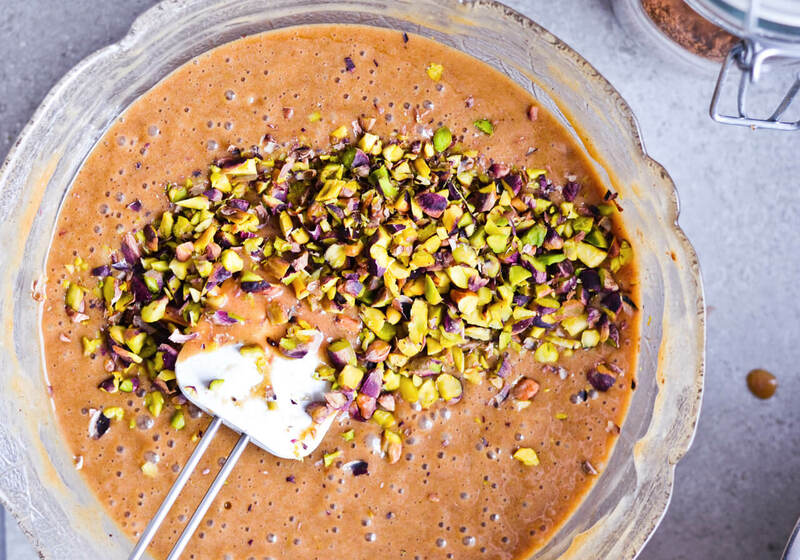 It’s dense and soft, not dry at all, spiced with cardamom and cinnamon. 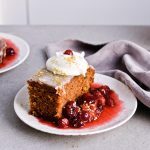 The extra kick also comes from dark muscovado sugar, which has a strong molasses flavor and consequently makes this cake not just beautifully deep brown but also gives it such a rich taste. I’ve honestly got nothing but heart eyes for this cake. 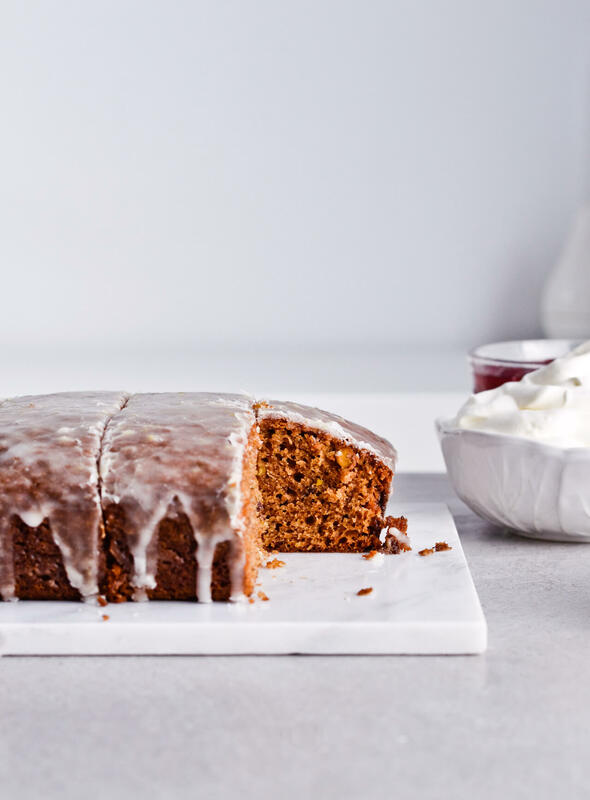 This Citrus pistachio spice cake can be served as is, sliced into bite sized pieces, to be enjoyed with a cup of something hot. But I’m in a festive mood, so I decided to pair it with cranberry compote, whipped cream and edible glitter stars. 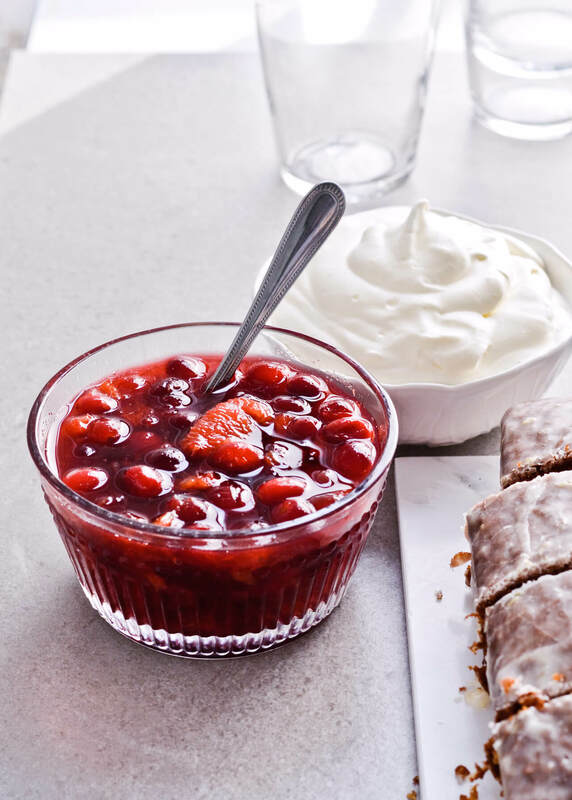 Now, the recipe is adapted from Bon Appetit and they suggest the compote as well. I’ve of course tweaked the recipe here and there, but the concept is the same. I really can’t get over this cake. It is spicy and citrusy and the compote fits into this equation so well. 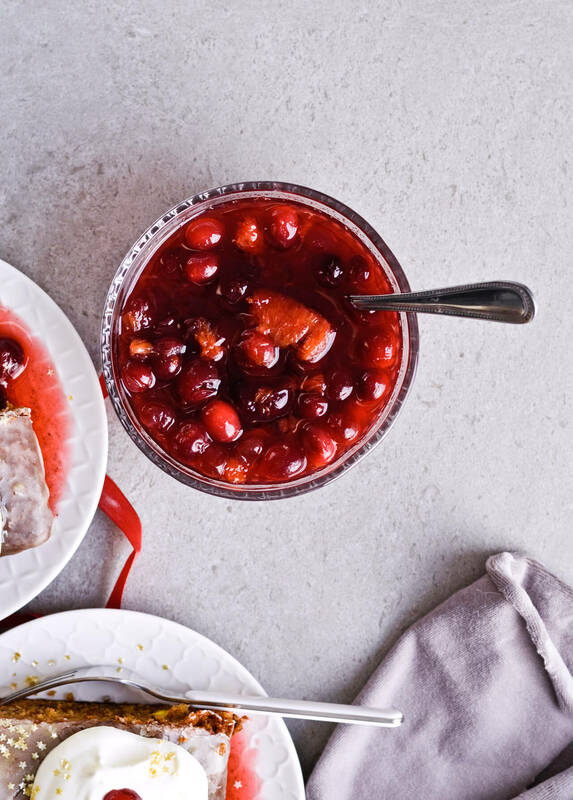 The cranberries are cooked with oranges and maple syrup, so you once again get this deep, sweet flavor along with some citrus zing and tart cranberries. 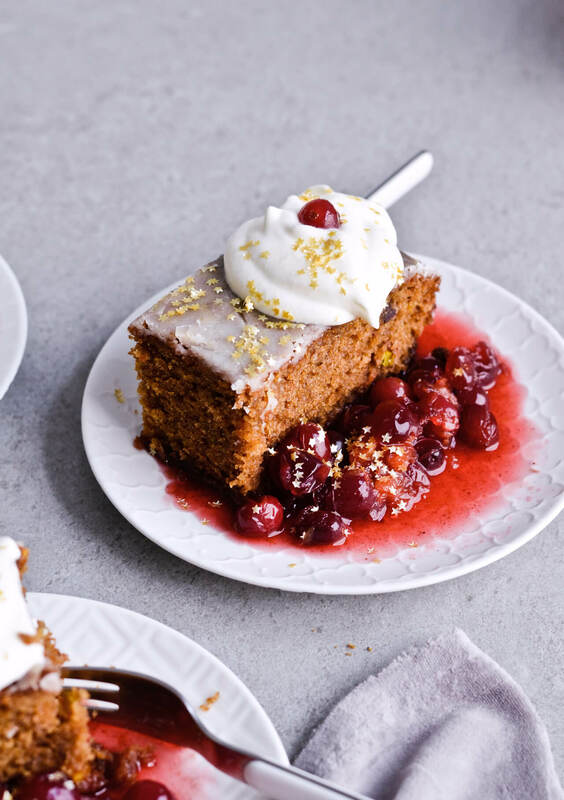 For the ultimate autumnal and/or wintry pleasure I would pair this cake with my apple mulled white wine. And I dare suggest you stock up on all the ingredients, because chances are you’re like me and you’ll want to make this cake again. And again. And again. But really, if you’re feeling festive and want a cake to show it then this is perfect for you. 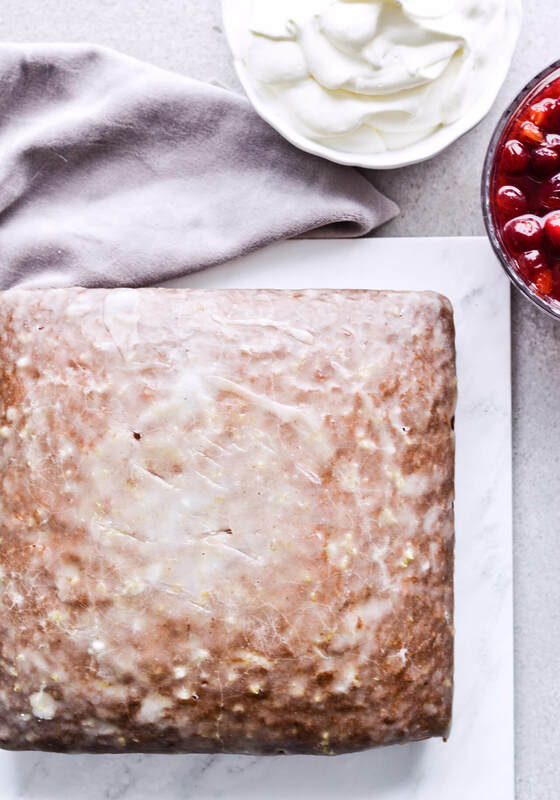 If you are not feeling festive at all, make this Citrus pistachio spice cake and I think you will be. Spicy cake just has that effect on people. 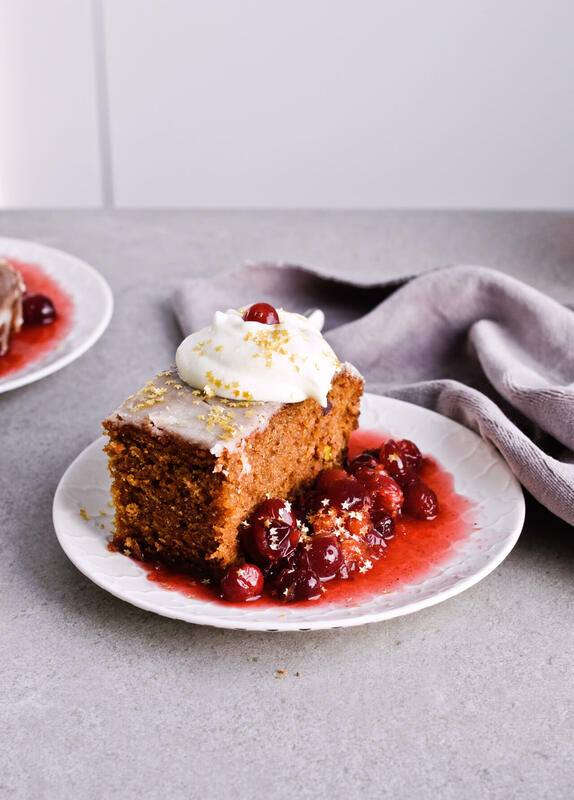 The perfect spicy sweet cake! 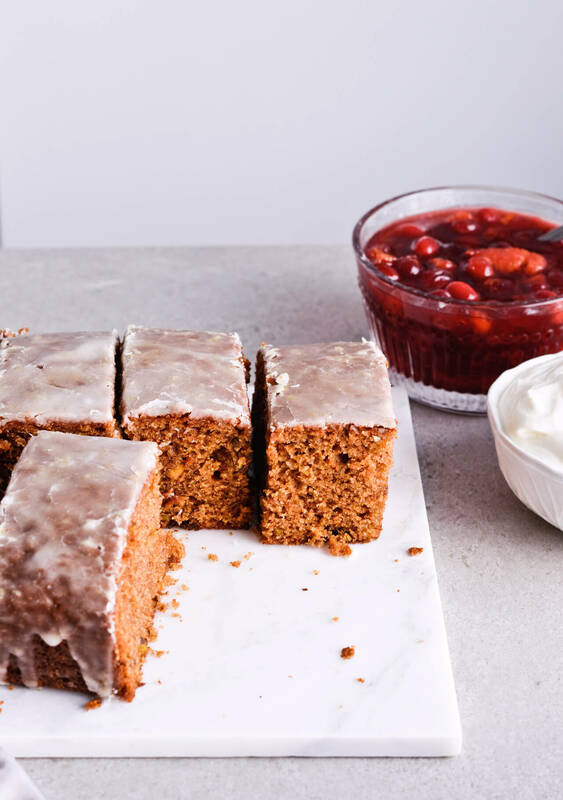 Recipe makes 8 normal servings; cake can also be cut into 16 bite-sized pieces. Preheat oven to 177°C (350°F). Grease bottom and sides of a 20-cm | 8-inch square pan with oil. Line bottom with parchment paper and brush paper with more oil. Set aside. Mix flour, cinnamon, salt, cardamom, baking powder and baking soda in a medium bowl and set aside. Stir sugar, brown sugar, and oil in another medium bowl until combined. Add eggs one at a time and whisk until combined and creamy. 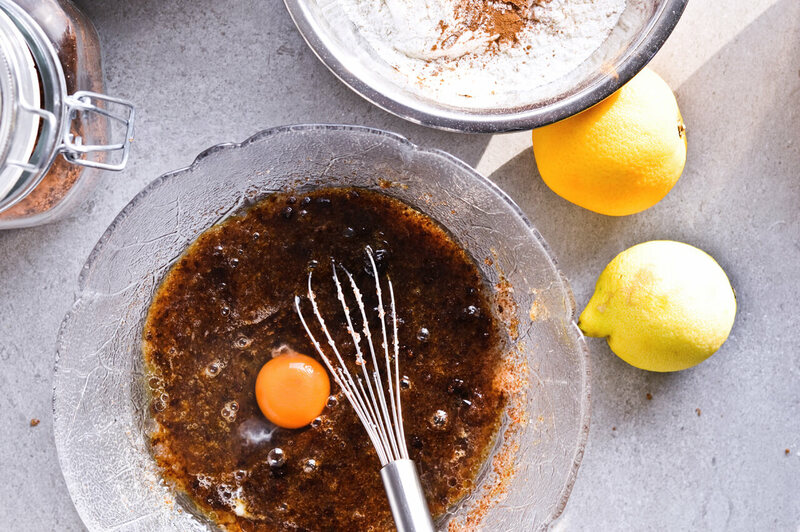 Whisk in sour cream, orange zest, lemon zest, and vanilla. 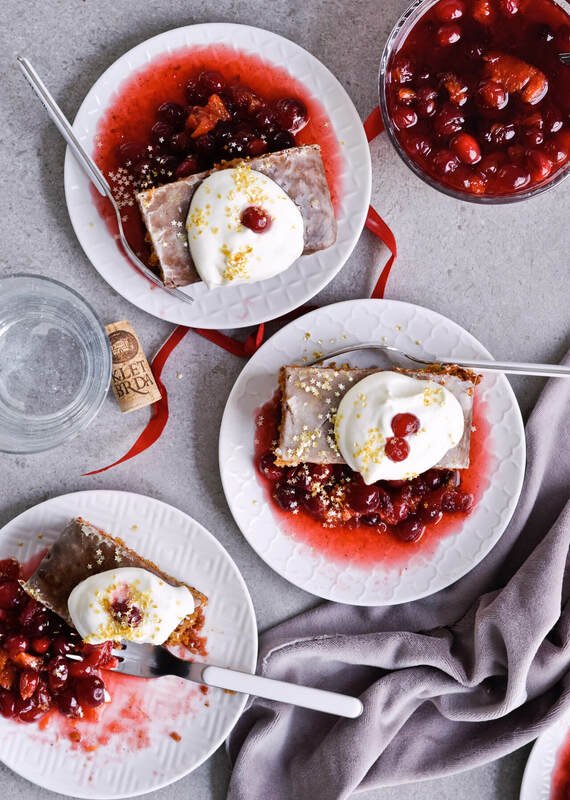 Whisk dry ingredients into wet in 3 additions, alternating with cider in 2 additions, beginning and ending with dry ingredients (flour – cider – flour – cider – flour). Once well combined, fold in chopped pistachios. Pour batter into prepared pan and bake cake for 50-60 minutes, rotate pan once halfway through. Bake until until a tester inserted into center of cake comes out clean. 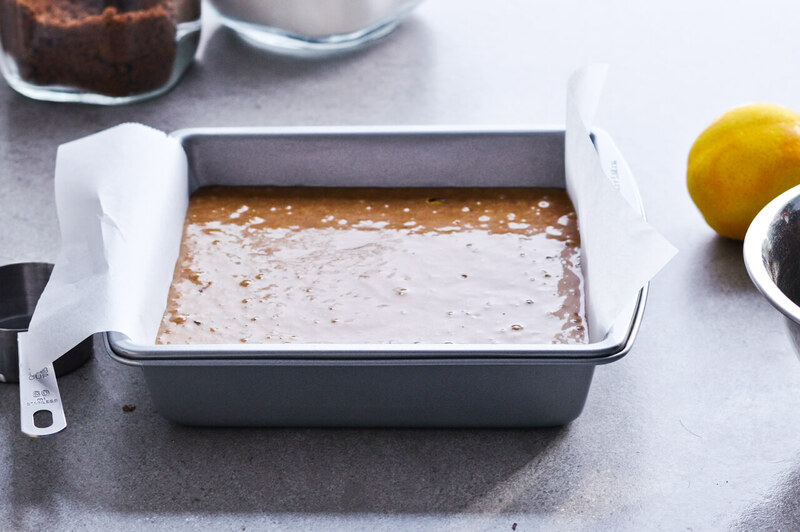 Transfer pan to a wire rack and let cake cool in pan for 15 minutes. Run a thin knife around inside of pan to release cake; turn out cake onto rack. Peel off parchment paper, then flip cake and let cool for 20 minutes. Whisk powdered sugar, lemon zest, lemon juice and salt in a small bowl. The glaze will be thick, but still smooth. Start by pouring some glaze in the center of the cake, then spread glaze all over warm cake. Let it drip down the sides. Let cake stand until glaze becomes dry, about 1 hour. The glaze will be smooth to the touch and will crack if you pat it. At this point you can serve the cake or save it for later. 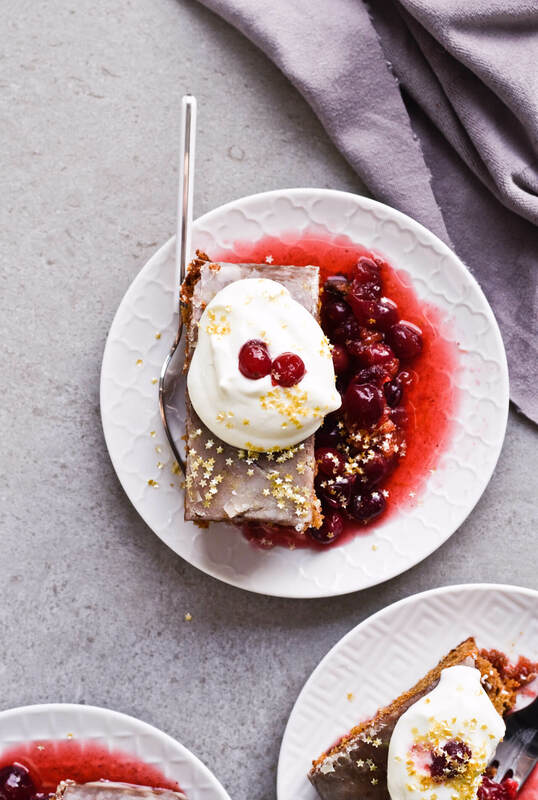 Serve it with a side of cranberry compote and whipped cream on top. Baked and glazed cake will keep for up to two days, kept in an airtight container or covered with plastic wrap, stored at room temperature. Combine 240ml (1 cup) whipping cream and 1 tablespoon powdered sugar in a large bowl or bowl of your stand mixer. Whisk cream on low-medium speed until medium peaks form. Transfer to a medium bowl, keep cream covered with plastic wrap in the fridge until serving time. It holds well for a few hours. 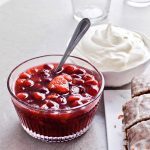 Recipe makes about 2 cups of compote. NOTE: It’s best if you make this as the cake bakes, to make use of the time and have fresh compote ready. However it can be made 3 days ahead. Grate zest from both oranges into a non-reactive saucepan. Set pan aside. Using a sharp paring knife, cut off peel and white pith from both oranges. Working over the pan, cut between the membranes to release orange segments into the pan. Then add cranberries, syrup, juice and vanilla. Cook over medium heat, stirring occasionally, until cranberries have burst and sauce has thickened, 5-10 minutes. Chill until cold. If making ahead, store sauce in a glass bowl, covered with plastic wrap. Return to room temperature before serving. Because I don’t have one. A pic-by-pic tutorial for segmenting an orange – via Pioneer Woman. Any suggestions for making this as a GF cake??? I rarely bake GF, so I don’t have much experience, but I would just use all-purpose gluten-free flour in place of the regular flour. And then I would add another egg and 1 tsp xanthan gum (that you add to the flour).